New Chinese Law Cracks Down On 'Rumor Mongers' : Parallels The Chinese government is one of the most aggressive when it comes to censoring the Internet and restricting social media. A 16-year-old boy recently became the first person arrested under a new law that bars the spreading of rumors. 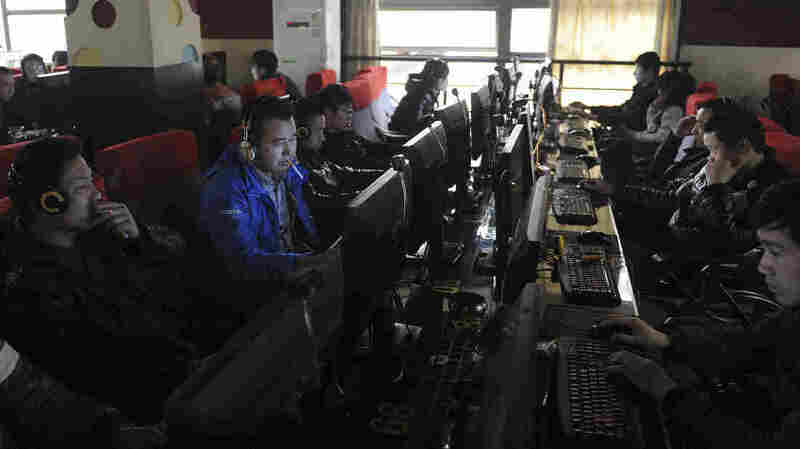 Chinese authorities go to great lengths to censor the Internet and control social media. A 16-year-old was recently arrested under a new law that bars "rumormongering" online. Here, customers use computers at an Internet cafe in Hefei, China, in 2012. Authorities in western China apparently wanted to make an example of 16-year-old Yang Hui. He was the first person in China to be arrested under a new rule against "rumor mongers," defined as people who intentionally post a rumor that is reposted 500 times or more, or viewed 5,000 times or more. But the government's case collapsed, the boy was released, and the local police chief was suspended after allegations that he bribed a local official (a coincidence, the China Daily reported). Many governments have taken measures to censor or restrict the Internet and social media, a topic we've written about often at Parallels. The Chinese in particular go to great lengths. But some observers are now wondering whether the new Chinese rules can be effectively implemented or are just an invitation for officials to abuse their powers and curtail citizens' rights. Yang Hui attends junior high school in Gansu province and lives with his grandfather. On Sept. 12, three days after the new rule was issued, a karaoke parlor employee was found dead on the street in Yang's hometown. The dead man's family refused to give his body to the police for an autopsy. The police confiscated the corpse and ruled the employee had committed suicide by jumping off a building. It's a scenario that has resurfaced in several news stories in recent years. Citizens do not trust the authorities, so they refuse to hand over corpses for fear that officials will destroy any evidence of foul play. Yang Hui questioned authorities' handling of the karaoke employee's death, saying that "the police knew long ago who the killer is." He posted pictures of street demonstrations and commented, "looks like people have to protest." The police arrested Yang Hui on Sept. 17 on charges of "picking fights and stirring up trouble." The police also accused him of "spreading rumors," "inciting crowds to protest" and hampering the police investigation into the alleged suicide. As criticism of Yang Hui's arrest spread online, the government retreated. His criminal arrest was downgraded to administrative detention. He was then released without charge on Sept. 23. Officials in Yang Hui's hometown said nobody was available to comment. Mao Shoulong, a public policy expert at People's University in Beijing, says the government's case was riddled with flaws. The rule criminalizing posts that are reposted 500 times applies only to defamatory content, not the charge of "picking fights and stirring up trouble" leveled at Yang. And even administrative detention, Mao adds, is inappropriate for minors. Reached by phone, Yang Hui's father said that there is no evidence that his son's posts incited anyone to protest. He added that his son "likes to express his opinion about major news," a right which every citizen enjoys. He said that his son "may never be able to escape from the shadow this ordeal has cast over him," and he reserves the right to sue the government for wronging his son. He added that after his son's arrest, his school "held a big meeting and told the other students not to do what my son did — post irresponsible comments online." In the end, though, he concluded, authorities simply "picked up a rock only to drop it on their own foot. They've bungled one thing after another." Other Chinese, meanwhile, remain in jail for other forms of "rumormongering," and the central government's larger effort to tighten control over public opinion continues. China Digital Times: Is 16-Year-Old 'Rumor' Poster's Release A Hollow Victory?